Color(s): Red, black, white, orange, fawn; may be solid, parti, merle or sable. 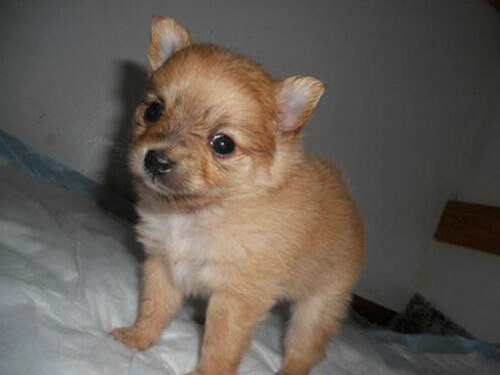 The Pomchi was created by the crossing of two breeds: Pomeranian and Chihuahua. They are referred to as a "designer dog". In 1998 a standard was set forth by the Pomchi Club of America. Possessing a sweet and intelligent expression, the Pomchi is short in stature, cobby, and muscular. They are well-balanced, elegantly boned, and bold. The Pomchi is affectionate, lively, and loyal. They do best in homes with older, considerate children. They are not recommended for homes with other pets. They are suspicious of strangers and will alert their family to visitors or out of the ordinary sounds. Pomchi's are aggressive and fearless and may bark incessantly. They are alert and typically become attached to one particular family member. The Pomchi requires regular brushing to remove loose and dead hair. Bathing should be done when necessary. Practicing good dental hygiene is essential to prevent early tooth loss. They may be prone to such health issues as patella luxation, collapsed trachea, hypoglycemia, and eye infections. The Pomchi may have a single coat that is smooth and short. They may also have a double coat that consists of a long, full outer coat and soft, fine under coat. Early socialization and obedience is recommended. The Pomchi is willful and may be difficult to housebreak. The crate training method works best. The Pomchi will not respond to harsh or heavy-handed methods. Training must be done with firmness, fairness, patience, and consistency. The Pomchi is well suited for apartment living. They are very active indoors and should have a variety of safe toys to play with. They enjoy securely leashed walks. A harness is recommended to prevent trachea damage. They also enjoy off-lead play time in a securely fenced yard.